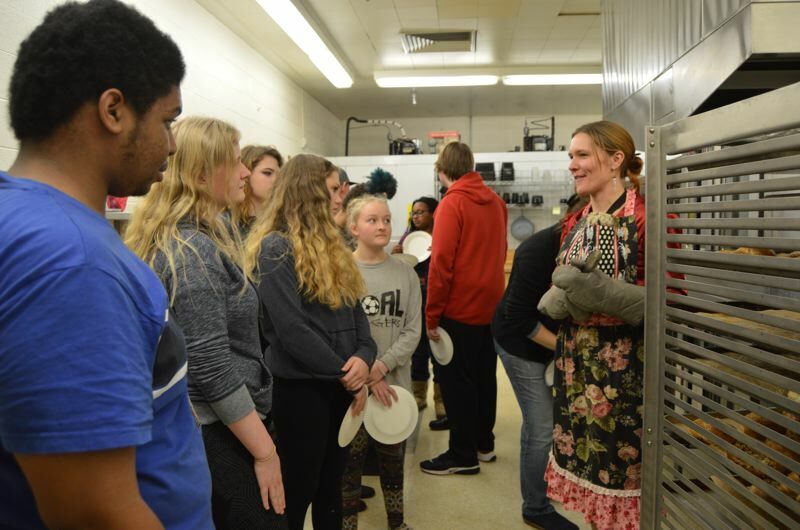 Scappoose High School students who took part in an elective called "bakery math" in January now have a better understanding of how math can be applied to everyday tasks. Kellia Holzworth, a math teacher at the high school, offered the elective. She recruited help from local businesses to show students how algebra and other mathematical concepts relate to baking and business. Students learned about ratios, conversions, reductions, economics and fractions during the three-week course. They also applied scientific concepts to their work and learned more about yeast and the physical and chemical reactions that take place in baking. The class was part of a program at the high school, called J-terms, that allow students to take three, three-week elective classes following the fall semester. The classes promote project-based learning and offer students who have fallen behind academically a chance to recover class credits. Some of the students in the class were working toward algebra credit recovery, while others wanted to learn about baking and cooking. Seeing students engage in the learning process in a hands-on way has been one positive outcome. "I have definitely seen motivation, participation and engagement increase as students are able to experience the math hands-on and with material that's 'real-world,'" Holzworth said. On Monday afternoon, Jan. 22, Janelle Gross, owner of Scappoose Bagel, took time to show students how much she uses math every day in her shop by hosting bagel-making workshops in the school's kitchen. The next day, Darcy McDonald, owner of Brown Butter Bakery, also stopped in to teach students how to make scones. "It's nice for students to get firsthand experience using math and especially to see professionals like the owners from Scappoose Bagel, Brown Butter Bakery and Angela from our own kitchen using math and applying it to their profession," Holzworth wrote in an email about the program. "I'm not a cooking professional or a home ec teacher but I love to cook and love math and hope to share those two things with the students in my class." Zander Powell and Dawson Stone, both freshmen, took the course because of their interest in cooking. They were surprised to learn that much of their coursework would revolve around topics they covered in their math courses. Stone, especially, enjoyed the interactive component, and said he never expected to make bagels in a math class. Sophomore Blake Carlascio enjoyed the small business aspect of the elective. Carlascio earned the nickname "Cannoli King" during the course after he developed a business plan for an Italian dessert shop, one of the assignments each student had to complete. Gross said she was particularly interested in visiting the class as a special guest because, as a small business owner and baker, she knows firsthand what goes into the process. "Ms. Holzworth contacted me about [the class] back in December to see if I would be interested in coming in, and I was all for it because we use a lot of math here," Gross said. Exposing students to real-world work experiences and other hands-on opportunities can be beneficial, and also might help inspire students to pursue their passions outside of the classroom, Gross explained. "I just think it's cool for the kids to see that, 'Wow! This is what goes into making a bagel.' It's not just like when you walk into a store and see a bunch of bagels out on the counter. There's loads and loads of work that goes into it," Gross explained. "I hope to also give some of them the inspiration of, yeah, I could do this too."